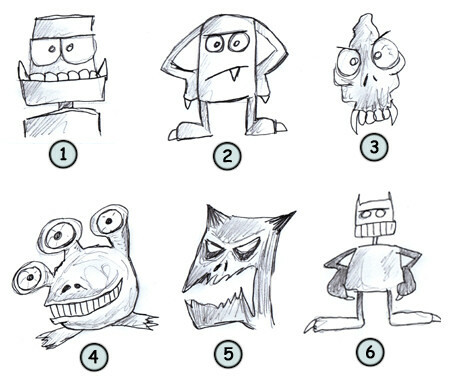 Drawing cartoon monsters: some fun facts before starting sketching! The most popular monsters are Bigfoot, vampires and werewolves. Monsters are without a doubt the most popular theme in B-movies! Ok... seriously! This monster is really well designed! A big body, long and strong arms. Some small legs! I really wish I would never meet this guy face-to-face! I might lose the battle! I also like the long horns and the numerous sharp teeth. But that's just one monster. Let's see how we could draw a funnier one! Start your lesson by drawing a rectangle for the body. Next, add some legs and some arms to your character. As you can see, this monster doesn't have a body. It's just a head with arms and legs! You can now sketch some nice finger nails to your creation. Finish your artwork by drawing the eyes, the mouth and a single tooth. Here you go! A funny monster ready to make people scream... or laugh! Use your imagination! 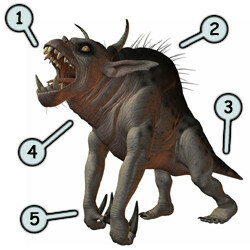 Make your monster funny (1), a little stupid (2), scary (5) or strange (4). Since almost anything with teeth and yellow eyes can look like a monster, you can't really make a mistake! Just experiment and create unique and original monsters for the fun of it! Have fun!